According to the president-elect’s inaugural committee, other faith leaders who are scheduled to be present include the Rev. Samuel Rodriguez of the National Hispanic Christian Leadership Conference; Paula White of New Destiny Christian Center; Rabbi Marvin Hier, dean and founder of the Simon Wiesenthal Center; the Rev. Franklin Graham of Samaritan’s Purse and the Billy Graham Evangelistic Association; and Bishop Wayne T. Jackson of Great Faith Ministries International. The Washington Post reported in a Dec. 21 story that Trump is scheduled to attend “a private family church service at St. John’s Episcopal Church near the White House,” where many previous presidents have worshipped just before being sworn-in. 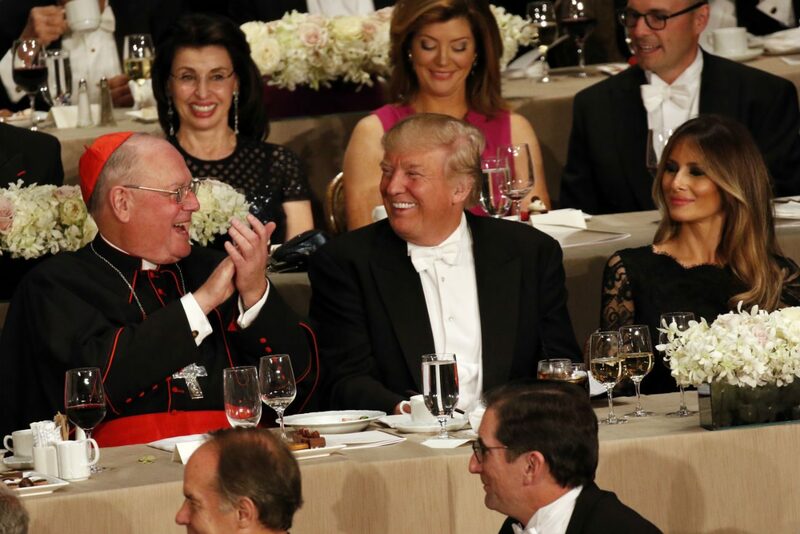 In October, Cardinal Dolan hosted Trump and his then-rival for the presidency, Democratic nominee Hillary Clinton, at the 71st annual dinner of the Alfred E. Smith Memorial Foundation. The charitable gala, which drew 1,500 people, is named for a former governor of New York who was raised in poverty and who ran for president in 1928. Smith was the first Catholic nominated by a major political party to run for the nation’s highest office. Put down the stones. Be proud we we’re invited. Cardinal Dolan will be the 1st Catholic cleric in 3 decades to be part of the main inaugural ceremony (after Catholic prayers were spoken at every presidential inauguration from 1933 to 1977). What an awesome example of Catholic love & mercy & hope Cardinal Dolan can share with millions of TV viewers. Goodness knows that Trump will need prayers. But it would be best if the Cardinal did that from St. Patrick’s. Another example of my church trying to legitimize unchristian, immoral and even at times illegal behavior. Unexplainable!